Smart IC, Each USB port intelligently identifies devices, ensure the fastest charge speed for your Devices. Safety Fire-proof Material, Two-Tone and Portable design. Perfect replace your original wall charger. This USB Plug is offered with limited manufacture's 12-month warranty. And we offer friendly and quick after-sale service. Quality Reliable: Smart IC inside protects against over-current, over-voltage, short-circuit and over-temperature, ensure safety and long life span. Safety Fireproof Material, Colorful Two-Tone and Portable design. Perfect replace your original wall charger. High Charging Speed, Dual USB Plug intelligently identifies your devices, charge your devices max up to 2.1Amp/5V, save your charging time. 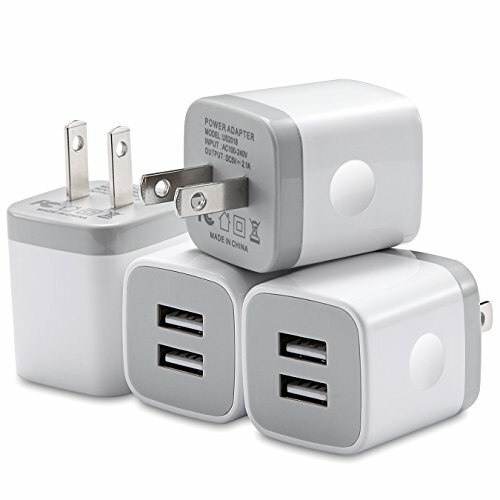 Pack List: 4-Pieces USB Wall Charger. 12-month warranty. and you will get the best and quick after-sale service. If any problem or questions please contact us, we will do our best to solve it. If you have any questions about this product by WITPRO, contact us by completing and submitting the form below. If you are looking for a specif part number, please include it with your message. Pelotek- 4 USB Ports Fast Wall Charger With Smart ID Technology ✮ 5 Advanced Protection System High Speed 15.5W 5V/3.1A Adapter✮ For iPhone, iPad, Android Phones, Tablets and ALL USB Enable Devices.